Israeli Air Force McDonnell Douglas F-15I Ra'am. Photo by Tech. Sgt. Kevin Gruenwald, USAF. It seems that the geographical name Middle East is truly inappropriate for the region that has been unstable for over seven decades, experiencing many regional wars: between Arabs and Israelis, between Iraqi Arabs and Americans and Arabs and Iranians and not to forget, of course, Arab civil wars as a follow up to the Arab Spring. Probably, the region should be renamed the War East instead of the Middle East. The Middle East is, yet again, gearing up to another war, but this time probably more destructive and more horrible. A war that could last longer than what is planned by the protagonists, on paper, because when ignited nobody will be able to stop it unilaterally. The risks seem to be very high and the gains, probably, very low. This media exercise well orchestrated to come in the heels of the American campaign to disengage from the nuclear agreement with Iran and to engage in a war with it, probably, afterwards. This war to be, will be waged by America, Israel and Saudi Arabia allied to Arab Sunnis in the region. “When Benjamin Netanyahu proved with file folders that Iran lied about its nuclear program, not one person thought Israel was the last country on earth that should have had the nerve to complain about this. After all, how has Israel acted on this very same issue for decades? Iran’s nuclear archive doubtless looks like a neighborhood lending library compared to Israel’s nuclear archive. But Israel doesn’t sign conventions, it doesn’t allow inspections and it lies. It mocks and winks – 60 years of continuous nuclear lies. In fact, it has never said a single true word about its nuclear program. It’s all for peaceful purposes, just as Iran claims its nuclear program is. The Dimona reactor was built for lifesaving PET/CT scans at Ichilov Hospital’s nuclear medicine department. “Next week, Israeli Prime Minister Benjamin Netanyahu will present his case against President Obama’s talks with Iran; he is expected to portray Iran as an untrustworthy actor and Obama’s diplomacy as naive and a distraction from more sanctions or even military action. In the past, the Obama administration was willing to give Iran a regional leadership role short of becoming a nuclear power but the actual administration has other plans for this country: an Iran without nuclear capabilities and Mullahs; an Iran secular and not willing to export its revolution or religion to the neighboring countries and threaten, thereby, their stability. In reality, Netanyahu did not come up with anything new, the whole world knows that Iran is working hard to become a nuclear power. This is no secret. It is an old dream that started with the Shah of Iran in the 60s of the last century and continues today, with open support from Russia that wants to build an eastern coalition to counter American hegemony. Nevertheless, It seems that this coming war is fully scripted by Washington and especially by the Trump administration. The main actors of this play are: Trump himself in the leading role and Mohamed Ben Salman -MBS- and Benyamin Netanyahu in support roles. Since arriving to the Oval Office, Trump has been demonizing Iran and expressing willingness to pull out from the nuclear agreement and next came on stage MBS who recognized Israel to make the American-Israeli-Saudi alliance legitimate and official. In an interview with the Atlantic newsmagazine,iv he called the Iranian Supreme Leader Khameini: Hitler, very much like what President Bush did before declaring war on Saddam’s Iraq. And last but not least, Netanyahu who, “brought to light” the Iranian hidden game. Now that every actor has pronounced his faith and acted his part, action will probably ensue after the Holy month of Ramadan. The war operations will be field shouldered by America and Israel and the role of Saudi Arabia will be to finance the effort (produce the play), maybe, fully and what else can Saudi Arabia do, anyway? players do, I had as lief the town-crier spoke my lines. How Is The War Going To Unfold? America and Israel are hoping to conduct an aerial war, short and sweet. Bombard the strategic locations where the nuclear installations are and destroy military targets to cripple the possibilities of Iran to respond adequately in the initial stages of the military operations. America and Israel are not planning to commit ground forces in this war to avoid colossal troop losses. They are banking on crippling the enemy with a massive initial blow that will lead, probably, to a popular uprising in the major cities of Iran that will finish off the regime. As for Iran it has another plan: a war of attrition that could be costly in human life to America and Israel and an uprising of the Shiites in the Eastern region of Saudi Arabia. For Iran the war will be total. 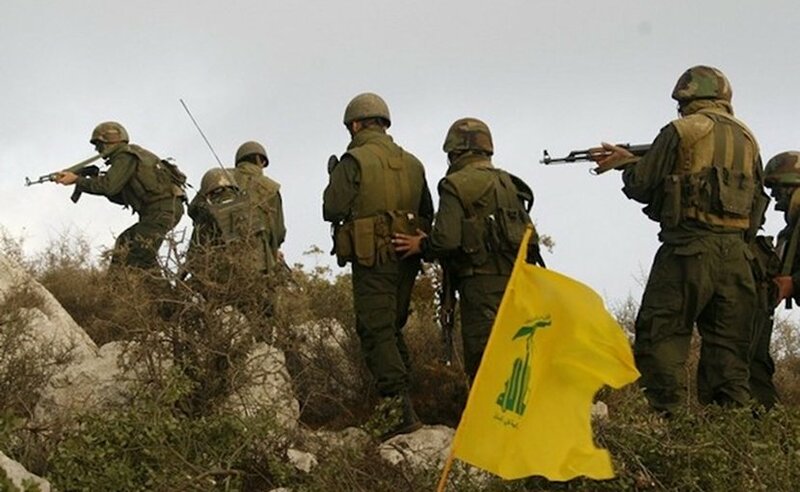 Attacks will come from Syria and Lebanon where Hezbullah will play a major role. 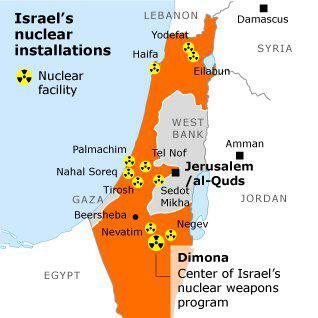 Indeed Hezbullah’s missiles will rain on Northern Israel and aim to cause as much casualty as possible. If America and Israel are planning on a short war, Iran is reserving them an attrition war long and costly which will make the Mideast a real inferno for a long period of time. No navigation in the Persian Sea, no security for a aviation in the airways and no peace on land. The war might be destructive for Iran but that will not finish off the regime of the Mullahs because in the field they can rely on the Revolutionary Guards and the Basijviii to protect them from any internal uprising. So, the onslaught might diminish their power but will not put an end to the theocracy at the country’s helm. 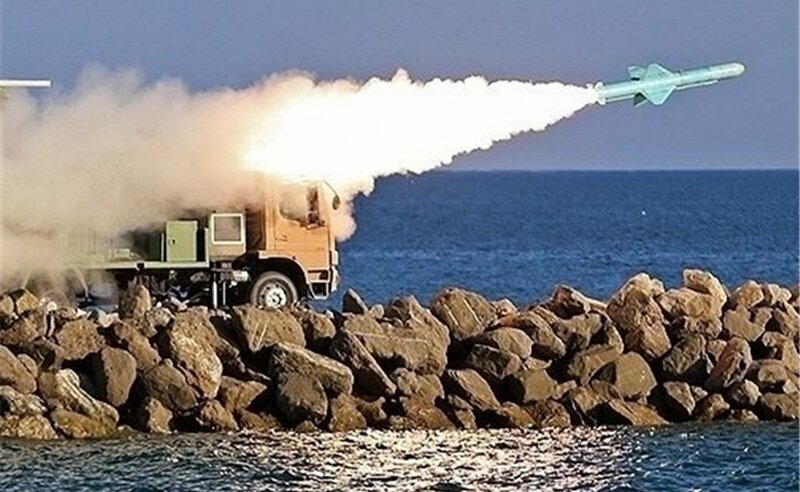 Iran Army fires cruise missile in war game. Photo Credit: Tasnim News Agency. However, a weak Iran in the Middle East will be good news to Israel and its Arab allies because it will lead to the probable downfall of Hezbuallah in Lebanon, the Alaouites in Syria and the Houthis in Yemen and this will, ultimately, destroy the Shiite Crescent in the Mideast and put an end to the expansion project and dream of the Islamic Republic of Iran, once for all. Consequently, Israel will come out of this painful war as the only power of the region and even as co-protector of Arab countries alongside America. The demise of Iran will mean the demise of Hamas in Gaza and Abbas will take over the strip and sign, under gentle pressure, a peace agreement with Israel. Saudi Arabia will regain its leadership of the Muslim world but will be totally broke. All in all, if everyone plays his cards right in this war, Israel will probably pay the biggest price in human casualties, but will undoubtedly win, also, big: destroy Hamas, rein in Abbas and emasculate the Arabs and, in addition, gain peace in the Middle East and a huge market for its products and strong economy in the region. America, Israel and Saudi Arabia are not probably meaning war for fear to destabilize a region that has already so many problems: Palestinian problem, Syrian conflict, Yemeni war, etc. What if these countries are only putting pressure on Iran to make it abandon its nuclear program totally, without firing a single shot? Probably, these countries are attempting the North Korean scenario, whereby the Americans on bearing tremendous pressure on North Korea made it accept to talk to South Korea first and later on to them, in order to arrange future denuclearization. Will such pressure bring the Mullahs to their senses and make them abandon their threats towards Israel and destabilization schemes vis-à-vis Saudi Arabia and the Sunni world? 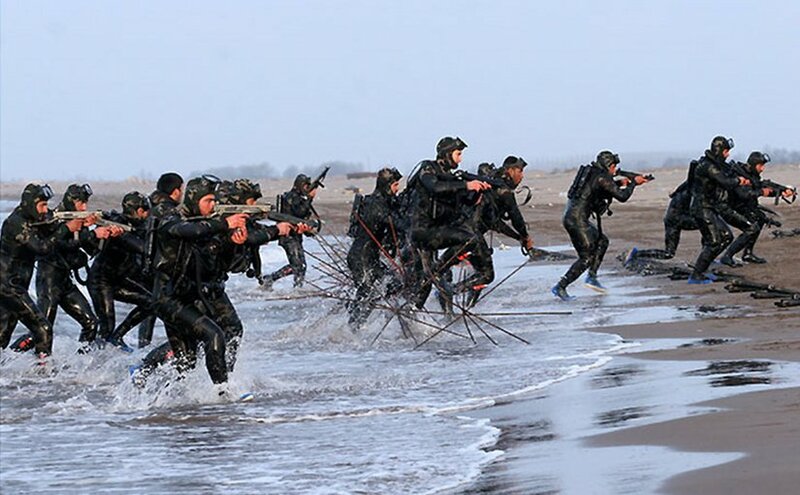 Iran’s IRGC’s Naval special forces, S.N.S.F. Photo Credit: sayyed shahab-o- din vajedi, Wikipedia Commons. The Mullahs have always been practical and sensible in politics and the chances are they will choose moderation and negotiation to avoid annihilation. If they do so, Trump, thus, would have won a political gamble which will add to his apparent present success in the Korean peninsula. These two political breakthroughs will probably ensure his reelection against the odds and will prove him right vis-à-vis the American people by making America great again. The war on Iran will, probably, be costly and horrible as all wars are, anyway, but in the end it will be probably worthwhile in the sense that it will bring peace to the region and a new era of cooperation and goodwill much needed by the population of the Mideast. However, will this war if it ever happens, bring democracy to the Arab world, at long last, or will the Arabs continue to prefer bread over a political system of representation and full accountability. It is difficult to see the outcome because the horizon is very hazy, to tell the truth. All in all, only time can tell, in the end. v. Edwards, Phillip, ed. (1985). Hamlet, Prince of Denmark. New Cambridge Shakespeare. Cambridge: Cambridge University Press. ISBN 978-0521293662.
vi. ttp://tradicionclasica.blogspot.com/2006/01/expression-aprs-moi-le-dluge-and-its.html On the subject of this famous saying, Gabriel Laguna from Córdoba, Spain. In any case, the phrase had a certain prophetic quality, if we interpret it post eventum as alluding to the breaking out of the French Revolution (1789-1799), which took place fifteen years after the king’s death and which cost the life of his grandson and successor, Louis XVI. b) The verb could also be understood as a subjunctive concession: After me, let the deluge come (it can come, but it makes no difference to me). In this second case, the speaker asserts that nothing that happens after his disappearance matters to him. Dr. Mohamed Chtatou is a Professor of education science at the university in Rabat. He is currently a political analyst with Moroccan, Gulf, French, Italian and British media on politics and culture in the Middle East, Islam and Islamism as well as terrorism. He is, also, a specialist on political Islam in the MENA region with interest in the roots of terrorism and religious extremism.